Toyota City, Japan, November 16, 2011—Lexus will display the next-generation "GS"1 series—its premiere in Japan—and the "LFA Nrburgring Package" at the 42nd Tokyo Motor Show. The show is to be held from November 30 to December 112 at Tokyo Big Sight in Koto Ward, Tokyo. Lexus has made it its mission to provide value that always exceeds expectations and will continue its pursuit of the essence of luxury as it seeks to provide unique value through designs that are instantly recognizable. Along with an exhilarating driving experience, Lexus strives for the development of a full lineup with the world's most cutting-edge hybrid systems and state-of-the-art technology. The next-generation GS, created to exemplify the future direction of Lexus vehicles, embodies superior design, drive and advanced technology. Marking its evolution with the "LFA" supercar, the "CT" dedicated hybrid, and the GS, Lexus is enhancing its uniqueness and presence as a truly global premium brand. With excellent handling and agility that take driving performance to a new level, the new GS exceeds its design aim of providing a refined and spacious atmosphere for traveling at any speed. The GS's rapidly evolved performance and state-of-the-art technologies further define the pleasure of ownership, the joy of driving and the feeling of luxury that resonates through the senses. The vehicle's spindle grille3 was developed in pursuit of new possibilities for the L-finesse4 design philosophy to create the archetypical next-generation expression of the Lexus-brand's refined essence and powerful presence. Meanwhile, the vehicle's interior has been expanded as far as possible while keeping the exterior dimensions approximate to the current model. 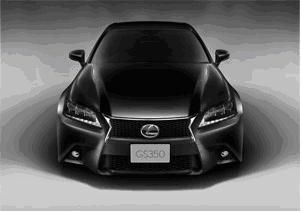 Representative of the exhilarating cruising style of the next generation of Lexus, the GS "F Sport" inherits the driving traits of the F series, of which the LFA is the pinnacle, and is a full-fledged sports version—with version-specific interior and exterior designs—of the next-generation GS. LDH, which controls Variable Gear Ratio Steering (VGRS), Dynamic Rear Steering (DRS) and other elements to realize the ideal vehicle slip angle, delivers an outstanding sense of security in the high speed range, edge and agility in the medium range and good maneuverability in the low speed range. The vehicle has tires of different widths and thicknesses for the specially designed 19-inch aluminum wheels at the front and back, with 18-inch ventilated disk brakes with two-piece aluminum hat rotor in the front. This ensures high grip-strength as well as excellent handling and brake performance. The exterior is fitted with specially designed features including the front grille, front bumper and rear spoiler, while the interior features model-specific seats, a leather steering wheel and shift knob, and an aluminum ornament panel. The interior also comes in GS-only interior color schemes of garnet and other shades. The design visually emphasizes the exhilarating cruising style of the F Sport and creates a unified and iconic image. 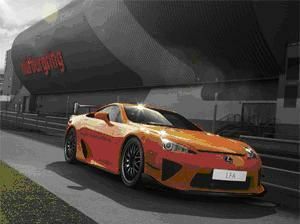 The LFA Nrburgring Package, named to convey respect and gratitude to Nrburgring, an LFA development site, is a model that emphasizes circuit cruising at a level higher than the standard specifications. The vehicle is scheduled for production in 2012. The vehicle features a carbon-fiber-reinforced plastic front spoiler and fixed rear wing to further enhance aerodynamic performance, and comes with a suspension designed for circuit racing and custom wheels for improved maneuverability and stability. The maximum output has been raised to 420 kW (571 PS) over the base LFA's 412 kW (560 PS) through improvements such as higher compression. Orders for the LFA and LFA Nrburgring Package, limited to a total of 500 units, closed in January 2010. 1Name derived from "grand touring sedan"
2Press days, November 30-December 1; special guest day, December 2; public days, December 3-11. 3The signature spindle grille, with trapezoidal contours evolved from current Lexus styling, features the fusion of the Lexus-unique inverted trapezoidal upper grille and a trapezoidal lower grille with a functionally integrated brake-cooling duct. 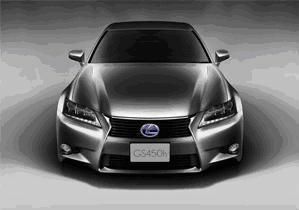 This distinctive new front represents the future direction of Lexus front-end design.